Bam Margera Sponsors, Skate Videos, & Photos | Skateboarding! 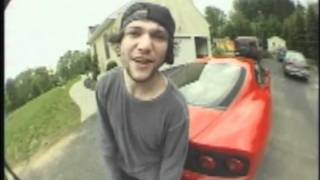 Brandon "BAM" Margera" is a professional skateboarder, television / movie actor, radio personality and all around daredevil. His grandfather gave him the nickname "BAM" at the age of three because of his habit for running into walls. As a teenager he and his friends created the "CKY" video series, which featured skating, pranks and stunts. It's also the name of his brother Jess' band. The acronym CKY stands for "Camp Kill Yourself". Following the success of the CKY series, former Big Brother editor Jeff Tremaine drafted Bam onto the team that would eventually become the cast of MTV's “Jackass” and the subsequent movies “Jackass: The Movie”, "Jackass: Number Two", "Jackass 2.5", "Jackass 3D" and "Jackass 3.5". Somewhere along the line he also started the MTV “Viva La Bam” series. In addition to Bam’s television and film projects, he continues to be heavily involved in the music industry through his work directing music videos, his show “Radio Bam” on Sirius Satellite Radio and his “Viva La Bands” CD/DVD series and tour. Over a very short period of time, Bam has proven himself as a top-tier athlete and innovator in the film, television and music industries. Is the main character in Activision’s ‘Tony Hawk’s Underground’ video game series, which is the best selling sports video game of all time. Holds the record for attendance at a personal appearance he made at the Mall of America. That would be in the ballpark of 30,000 screaming fans. Is sponsored by leaders in the skate boarding industry; companies like Element, Destructo, Fairmans and Electric. Merchandise is the best selling of any other signature series in action sports. @finalchez108 we ship worldwide, from Estonia!